The NYTimes has breathtaking satellite photos of the hardest hit areas of northeastern Japan where the tsunami came ashore. The photos are superimposed with a slider that allows you to see dramatic before-and-after views. Entire towns have been wiped completely off the face of the earth. It's heartbreaking. Update: ABC has some additional overlayed photos. Thanks to Faisal for the link. The risks of dependence on seawalls was most evident in the crisis at the Daiichi and Daini nuclear power plants, both located along the coast close to the earthquake zone. The tsunami that followed the quake washed over walls that were supposed to protect the plants, disabling the diesel generators crucial to maintaining power for the reactors’ cooling systems during shutdown. Cooling system malfunctions caused overheating and partial fuel meltdowns at two reactors at the Daiichi plant, Japan’s worst nuclear accident...the diesel generators were situated in a low spot on the assumption that the walls were high enough to protect against any likely tsunami. Some critics have long argued that the construction of seawalls was a mistaken, hubristic attempt to control nature as well as the kind of wasteful public works project...[a] fuller picture of how seawalls protected or failed to protect areas beyond the nuclear plants will not emerge for at least a few more days. But reports from affected areas indicate that waves simply washed over seawalls, some of which collapsed. Even in the two cities with seawalls built specifically to withstand tsunamis, Ofunato and Kamaishi, the tsunami crashed over before moving a few miles inland and carrying houses and cars with it. 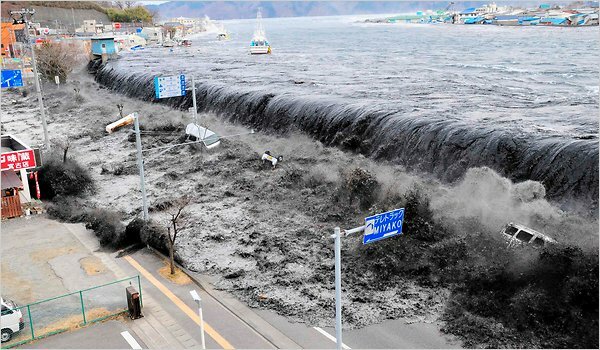 In Kamaishi, 14-foot waves surmounted the seawall — the world’s largest, erected a few years ago in the city’s harbor at a depth of 209 feet, a length of 1.2 miles and a cost of $1.5 billion — and eventually submerged the city center. It remains to be see how the people and politicians in Japan will react to these events. For now, our hearts go out to the homeless, the wounded, and the departed.